Quite sometime ago I went on a fun trip shopping with a friend of mine. We went to all kinds of furniture and home decor places. We weren’t shopping for anything particular and I was mostly shopping for inspiration. 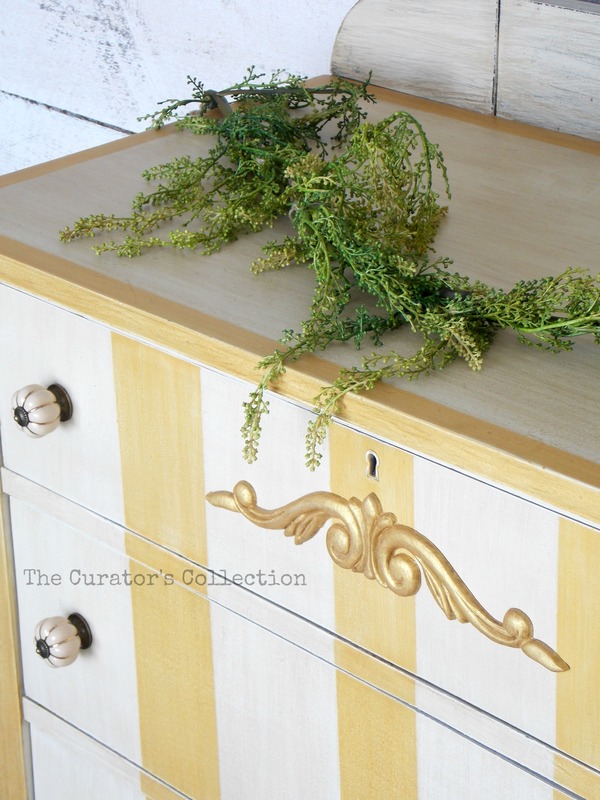 Sometimes I need a little furniture excitement to get me going again. One of the places we stopped in at was Chintz & Company, I had never been there before and boy do I love it! While the prices might be beyond what I can sometimes afford, there is always an abundance of inspiration in their beautiful chandeliers, furniture and fabrics! 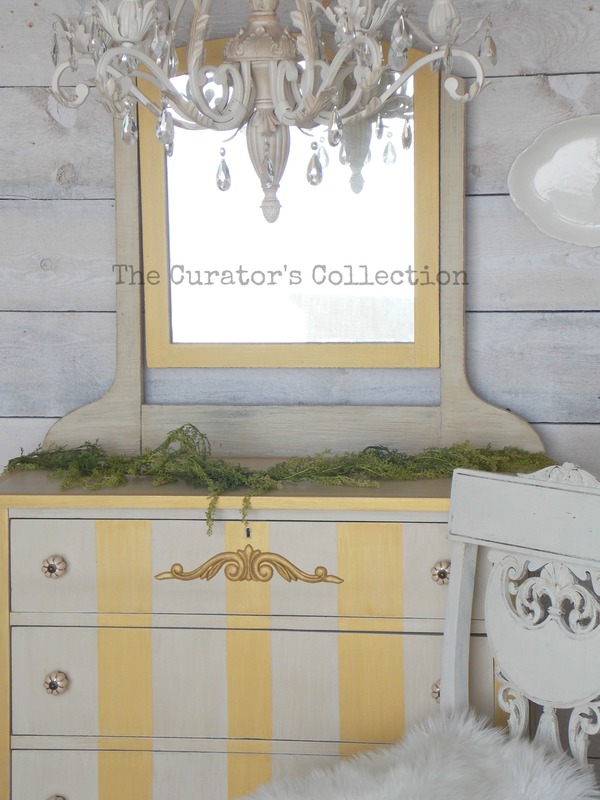 After seeing some of their gorgeous dressers and buffets, I came home inspired to paint one of my antique dressers similar to what I had seen on our trip. 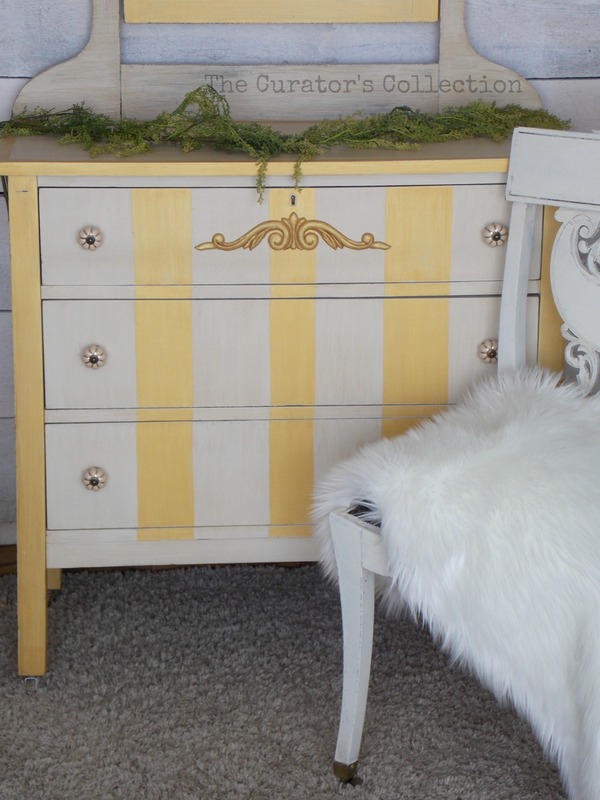 I had purchased this sweet little chest of drawers off of a local classified website for an amazing price. It even had the harp and original mirror which makes this purchase even more sweet. After all my usual prepping I got to work painting. Even though the finish is dark I decided to take a chance with bleed through and headed straight for the warm white FAT paint. I really thought it would bleed through but to my amazement it was fine. I painted the whole piece with warm white first and sanded it smooth. Then I taped off the entire piece and painted on my gold stripes. 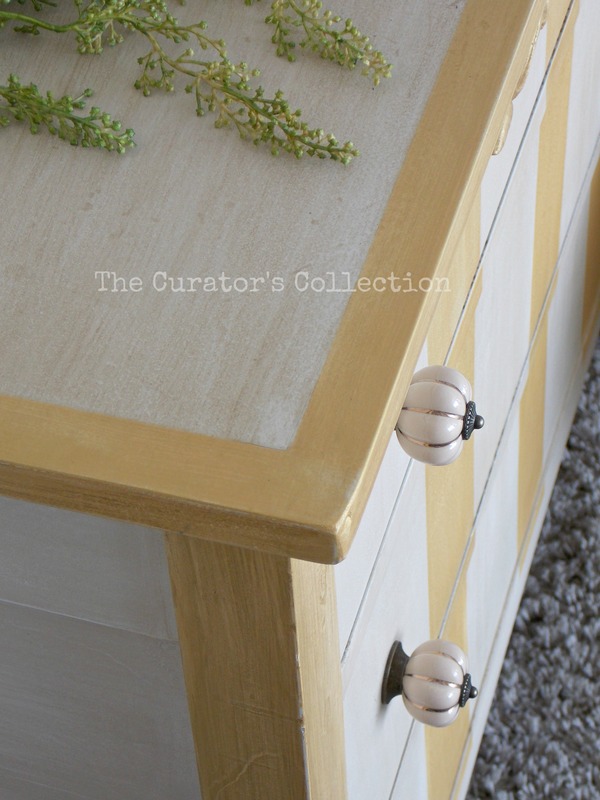 First I started using the pale gold metallic paint by fusion but wasn’t happy with the way the gold was looking so I went over it again with the specialty glaze by the FAT paint company in Raw Sienna. After removing the tape I gave it another light sanding to smooth it all out. After a generous coat of clear wax I decided that the gold still looked too bright to me up against the warm white. 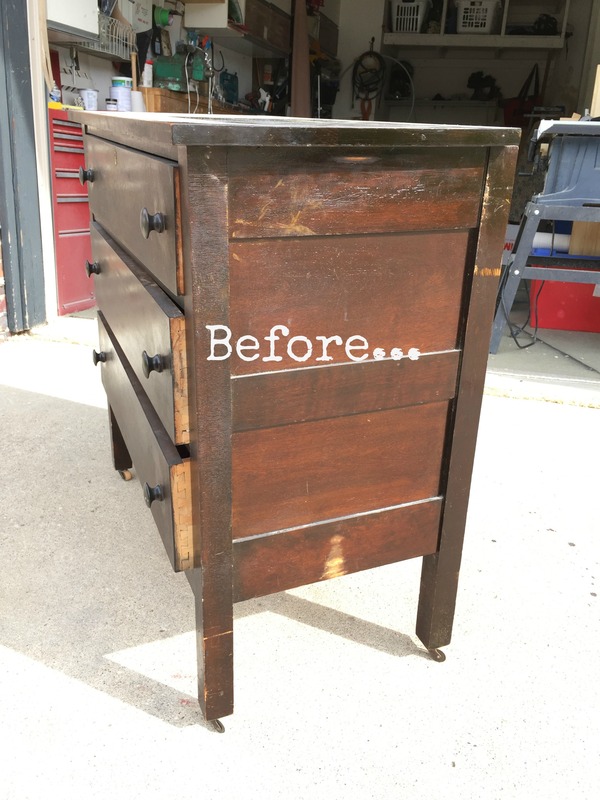 I decided to go over the entire piece again with a light coat of dark wax to tone it down. After a lot of buffing it was time to add the final detail of some new hardware with metallic accents to tie it all together! It certainly has that “Chintz” feel. Now It just needs to find a “forever” home! Oh how pretty! What a great update to a piece many people would have thrown away. Great job! Thank you for the sweet comment! I hope you have a great week! Thank you Cheryl! You made my day with your sweet comment! I hope you have a great week! Fantastic! This is something different and I will have to copy it. You are waaaaaay too nice! I missed you while I was away doing other “stuff” ;) I hope you have an amazing week! ~a whole store of Chintz? Whoa, THAT would be something! Ha ha!I wish! It’s just the name of the store silly! “Chintz & Company”. I hope you have a great week Catherine! You have amazing talent! So glad to have you back posting. Happy New Year. Awe thank you Cynthia! You are so nice! It’s nice to be sharing here again! I hope I can find the time to keep it up, I really miss posting regularly. Wow, sounds like my kind of store. I love how this turned out, Terry and you won’t have trouble selling this piece. Would also be great for a nursery. Have a great day. Thank you Mary! I think it would be perfect for a nursery too! Hope you have a great weekend! 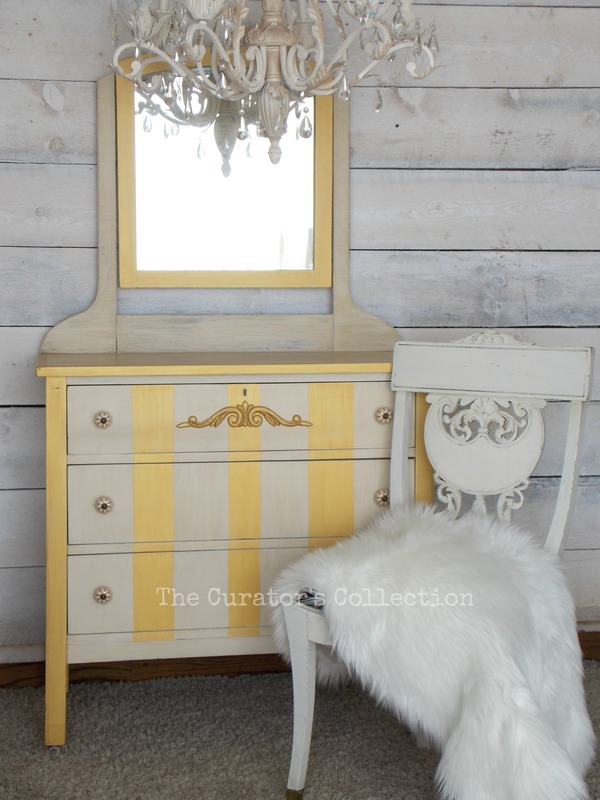 The dresser is simply gorgeous and I don’t expect it will be looking for its forever home long. You are sweet to say so Debra! Thank you! Smiles! I hope you have a great week! Thank you for the invitation! I try to make it to your next party!